Poor sugar control is responsible for a number of deadly problems like cardiovascular disease and kidney failure in diabetics. A healthy diet will keep their sugar levels in control and reduce the risk of diabetic complications. 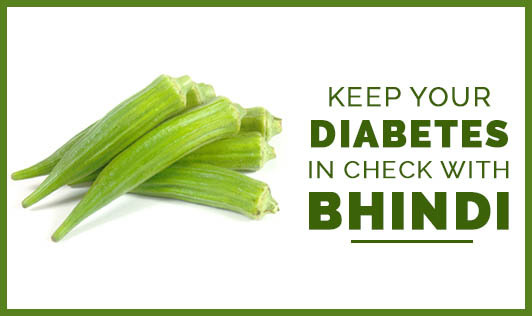 There are a number of diabetes-related benefits of including bhindi in your diabetic diet plan. Glycemic Index- Bhindi has a very low GI of <20, which helps you keep your sugar and weight in control. Soluble Fiber- Half cup of bhindi gives you about 4.1g of fiber, out of which 50% is soluble. Soluble fiber helps to slow down digestion, glucose absorption, thereby delaying and reducing the impact of carbohydrate-rich foods on blood sugar levels. It also throws out bile acids from the system and reduces blood cholesterol levels. One needs to take at least 25g of fiber daily, to reduce high sugar and cholesterol levels. Alpha-Glucosidase Inhibitor- According to a recent study bhindi seeds is full of alpha- glucosidase inhibitors. These enzymes prevent conversion of starch to glucose and thus reduce the sugar levels in the blood stream. What all this means is that, bhindi can only help prevent your sugar spike and keep it in control and therefore may only help you prevent diabetic complications. Bhindi by no means helps you "CURE" diabetes.